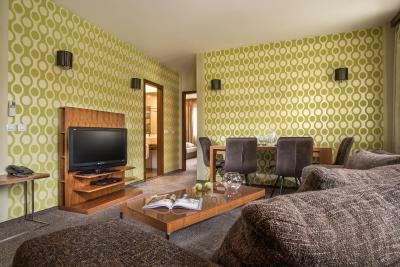 Lock in a great price for Boutique Hotel Uniqato – rated 9.1 by recent guests! Good location. Good room options. We took one of the little duplexes. 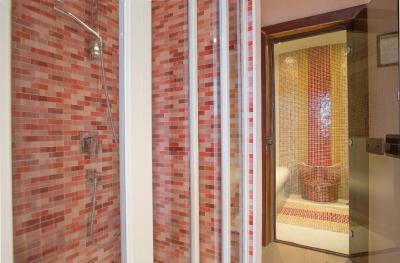 Beautiful room with private access to the spa area. 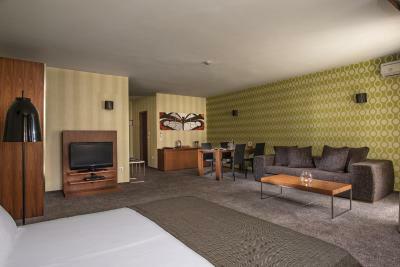 The rooms were spacious and well decorated. The Victoria restaurant room service with 20% discount was a bonus. Really enjoyed our stay in this hotel! 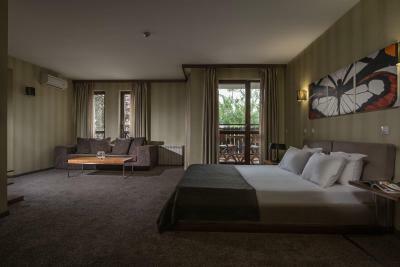 The room was perfect, very cozy and comfortable especially after a difficult day!! 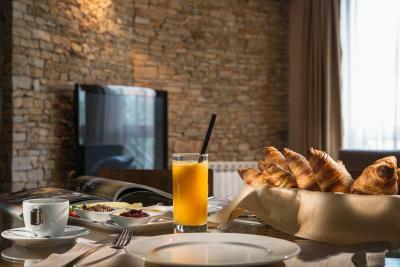 Excellent location in the heart of Bansko and very good breakfast. Totally recommended. Very friendly staff. Private parking. Excellent breakfast. Great rooms. Best location, fantastic spacious room, great stuff that's always smiling and helpful, garage parking. Really nice little gem. Really cute and homey hotel. 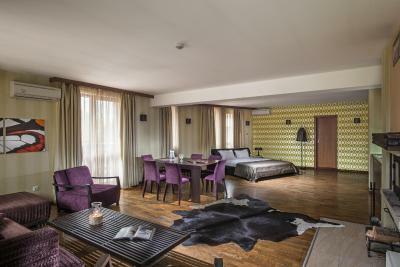 The attic rooms are very cozy and quite roomy. Being able to order room service from Victoria restaurant was a definite plus. 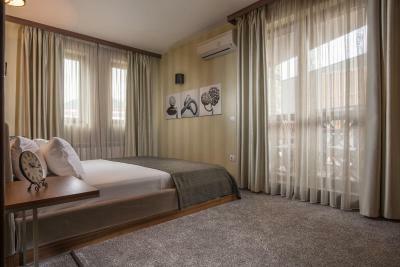 Boutique Hotel Uniqato This rating is a reflection of how the property compares to the industry standard when it comes to price, facilities and services available. It's based on a self-evaluation by the property. Use this rating to help choose your stay! 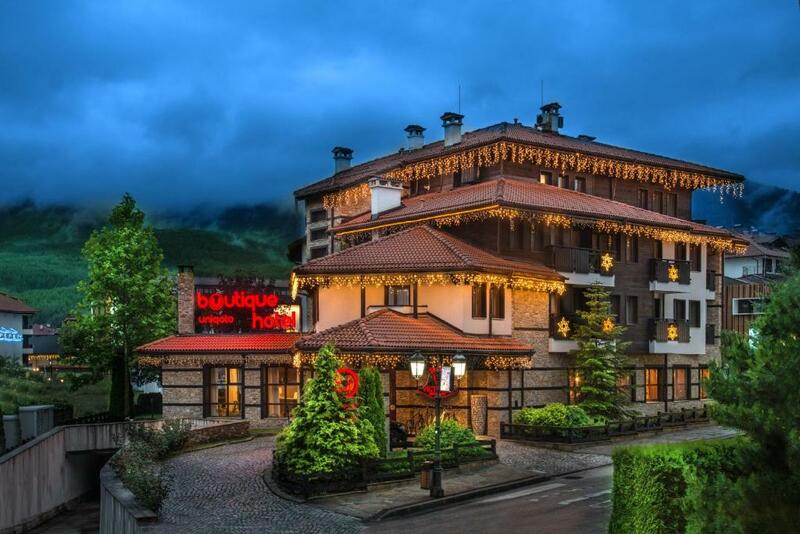 One of our top picks in Bansko.This charming Boutique Hotel Uniqato benefits from a quiet and central location close to the ski area of Bansko and just 350 feet from the ski elevator. 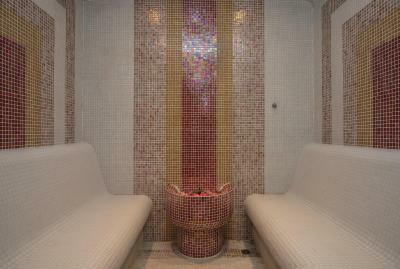 Free Wi-Fi is available throughout the property, and guests have free use of the sauna and steam bath. 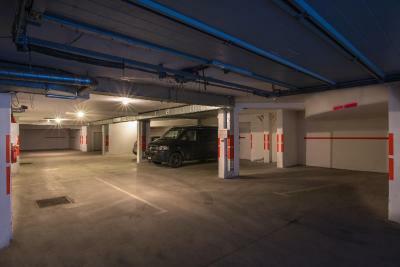 Private underground parking is accessible with a room key card. 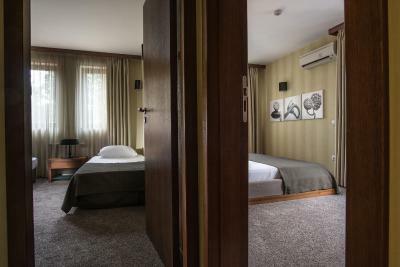 The cozy and spacious rooms are decorated in natural colors, in calming green, wooden brown and ecru shades, creating a modern, fresh and relaxing style. Restaurant Victoria is located on the 1st floor, where mouth-watering dishes are served by a skillful staff, surrounded by an unique interior. There are 80 indoor seats and another 70 among a lush summer garden. Reservations are highly recommended. 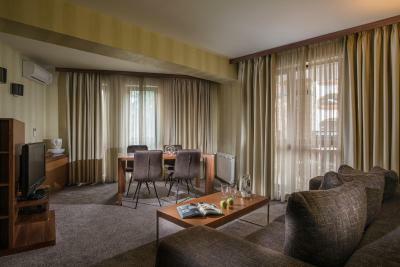 Boutique Hotel Uniqato is conveniently built for skiers – right next to the entrance there is a ski closet that can also be accessed with a room key card. 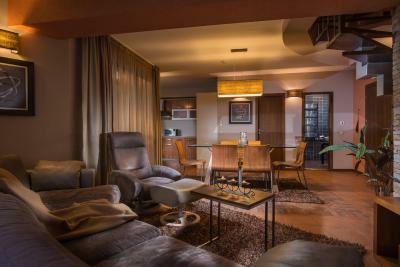 This property also has one of the top-rated locations in Bansko! Guests are happier about it compared to other properties in the area. 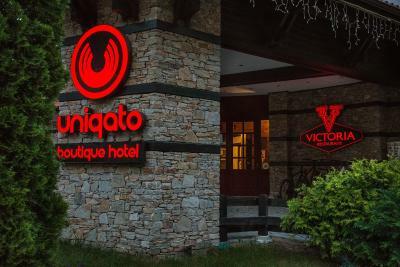 When would you like to stay at Boutique Hotel Uniqato? Offers a balcony that provides a view of the mountains. 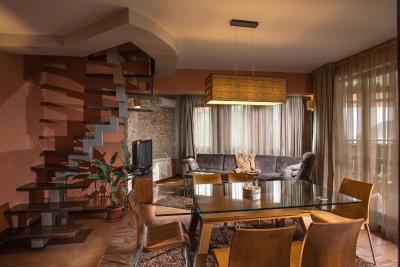 It is an artistic type of studio with wooden columns, with a very romantic outlook. It is approximately 72 ft² big. 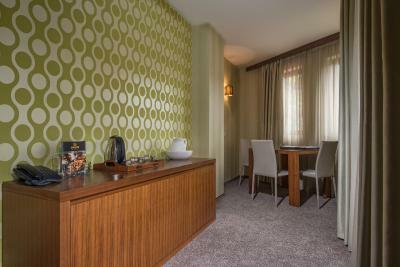 The room offers a private entrance to the spa area and two balconies that provide mountain view. 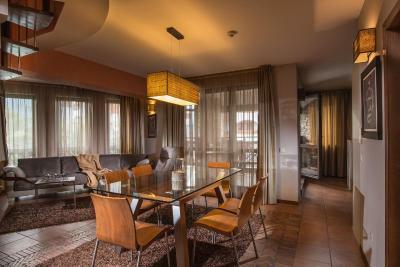 Offers a balcony that provides a view of the mountains and a flat-screen TV. 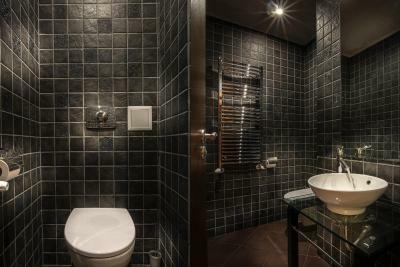 This room comes with a private bathroom with a shower. 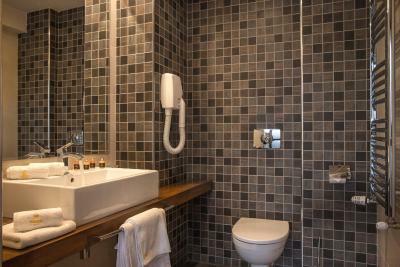 This suite comes with a private bathroom with a shower, a flat-screen TV with cable channels and a balcony. 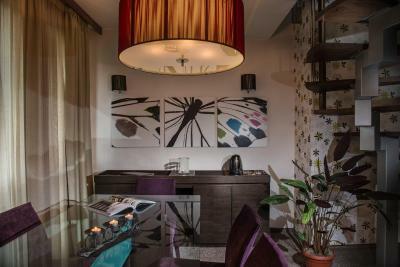 House Rules Boutique Hotel Uniqato takes special requests – add in the next step! Boutique Hotel Uniqato accepts these cards and reserves the right to temporarily hold an amount prior to arrival. 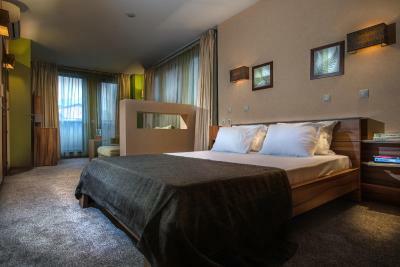 Nice boutique hotel. 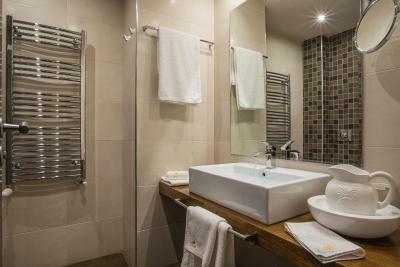 Lovely big room and bathroom. Very clean. Didn't have much dealings with staff but they were very nice and accommodating. Breakfast was lovely and started at 7am which was great as we like to get out skiing early. 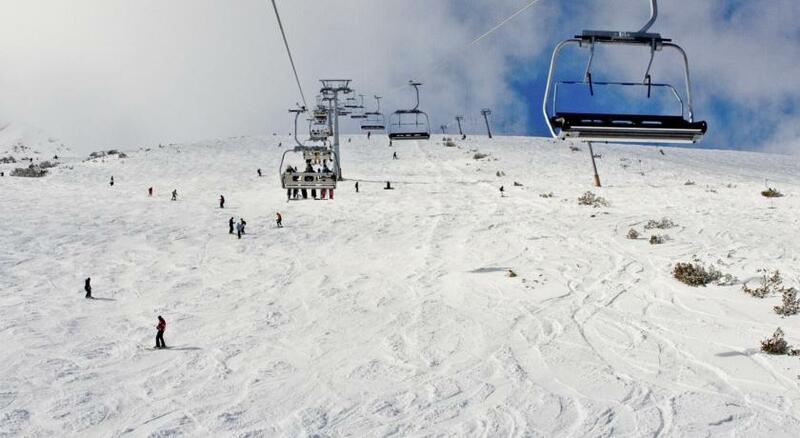 The main gondola is only a few minutes walk away. The Victotia restaurant which is attached to the hotel has a huge menu and the food is delicious. 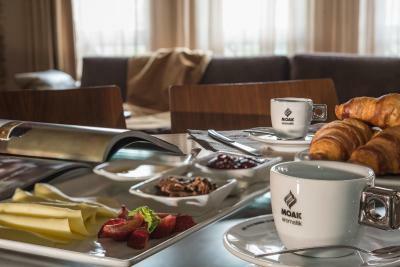 Also as a guest at the hotel you get 20% discount on room service. Overall couldn't fault our stay here and will definitely stay again. The only negative thing is (to my opinion) the relatively poor breakfast that definitely needs improvement. 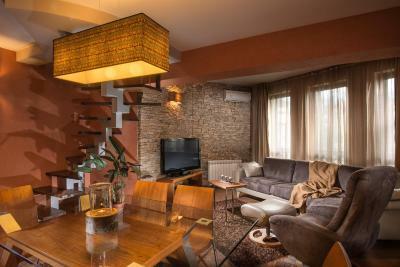 Other than that, Uniqato is way above average and a great choice for your staying at Bansko. 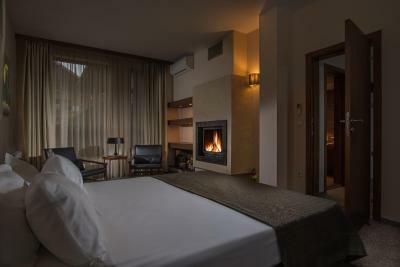 Opposite to the dominant Kempinski, Uniqato’s location could be characterized as the definition of a ski in ski out hotel. 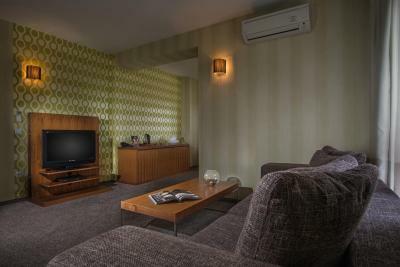 The rooms are comfortable and next to that, one may add as assets the famous Victoria restaurant (hosted at the hotel) and the free parking. It’s a little run down and would need a revamp. 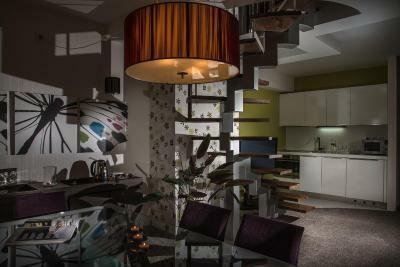 The location is perfect and the rooms are spacious. The room stinks as a cat toilet, requested to someone to come... they never came. Elevator didn't work for several hrs. Requested wake up call... didn't happen. no Jacuzzi, no swimming pool. just Sauna. Close to the gondola station, in the middle of town, the excellent Victoria restaurant is located right at the hotel. Good breakfast - not too large but enough for a day of Ski. 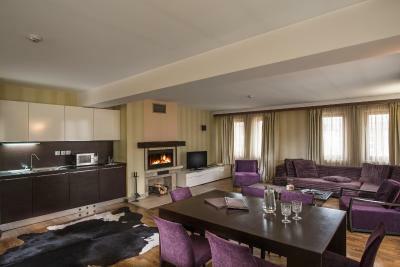 Rooms are extremely larger than last year's at a different hotel in Bansko. Breakfast could have been better, front of house lady at restaurant was outright rude. 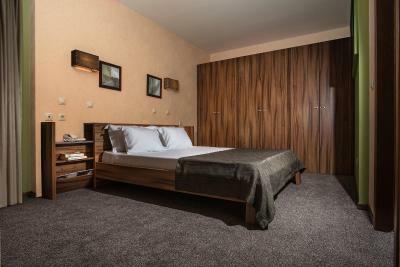 Great sized rooms, friendly and helpful staff and an unbeatable location. Great restaurant and the room service is great for convenience. Spa was nice and rarely used. Horrible treatment to customers. Breakfast was highly disappointing. Beds were uncomfortable. There was a red, blood looking stain in the bedroom. On one of our last days we came back to our room, to realize the clean lady accidentally threw away a cig pack we hid money at. We looked around and saw that an empty kinder pack, dirty tissues and some other trash that wasn't thrown away, while the cigarette pack was tossed. I went to Tania at the reception, and she kept insisting the cleaning ladies wouldn't throw a cigarette pack. After telling her we had money there, and had already lost a wallet once throughout this trip, I expected her to tell me they'll offer to somehow make up for this horrible mistake, but instead all Tania said is "You can look in the trash outside." I went to go through the trash, ironic, since we were staying at the priciest room at the hotel. After a minute or two of going through trash bags we found the cig pack w the money in it. We went back to the reception to let them know we found it, and to tell them that this situation wasn't handled well. All they said was "well talk to the staff to make sure this doesn't happen to anyone else". Well, I hope this doesn't happen to anyone. 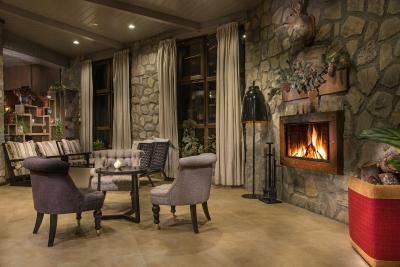 We thought the management would try spoiling us with a massage or some new woods for the fireplace to try making it up for us, for having us go through the trash, but we didn't even get a "sorry". Defiantly would stay elsewhere next time. Breakfast could have been better. It was very basic, lacking variety. Location was perfect. Right next to the Gondola station. 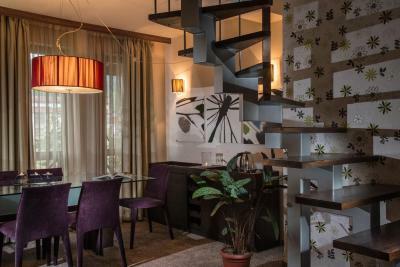 The Italian restaurant of the hotel serves super tasty meals. If you order room service from the restaurant you get 20% off menu prices. there was a constant unpleasant smell (in the room, in the bathroom, in the hotel). we had an issue with the window blinds. I would not recommend the attic room for tall people (there was no other free room when I booked). The room was warm and spacious. Decent breakfast with good coffee. 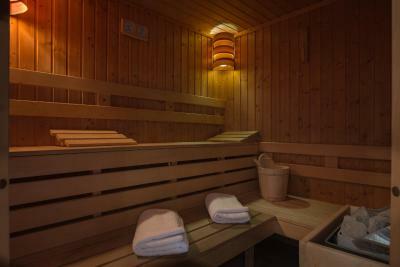 Sauna open non-stop. Great location next to gondola. The restaurant downstairs is very good (reservation is recommended). 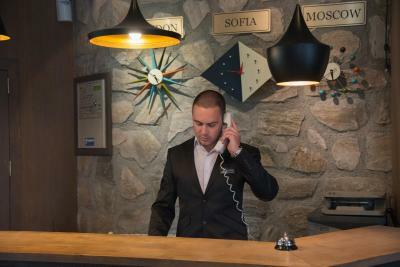 During our stay, we had two receptionists downstairs. One of them was very helpful, but the other was a grumpy, arrogant and lacking manners. Then, the WiFi connection was very poor, and the way the plates are stored at night in front of the rooms - this is anti-hygiene. Sorry guys, that’s Europe, not America, please clean up the area. 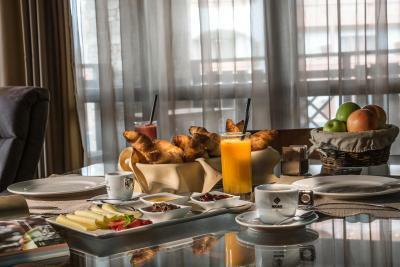 The hotel’s restaurant, “Victoria”, is just amazing, food, coffee, croissants, etc. Their room service is also very fast. Also, hotel has a decent spa center, which could be available for about an hour per day.